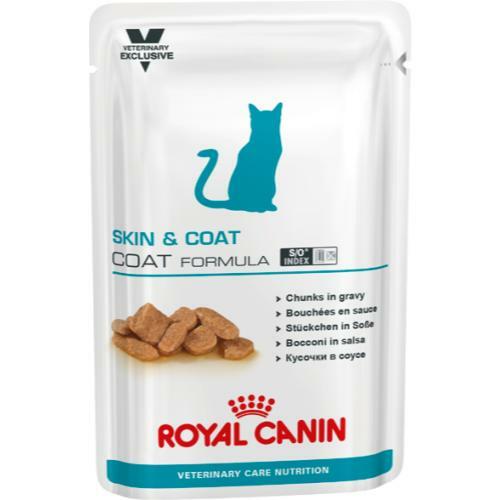 Royal Canin Skin & Coat Formula is a complete wet food for adult cats over 1 year old. This highly palatable food has been specially formulated to appeal to cats suffering from skin sensitivities. It contains a complex formula of vitamins and protein which help to restore a smooth and silky coat. Complete feed for adult cats over 12 months old with skin/coat sensitivity. Meat and animal derivatives, fish and fish derivatives, cereals, derivatives of vegetable origin, vegetable protein extracts, minerals, yeasts, various sugars. Vitamin D3: 275 IU, E1 (Iron): 10 mg, E5 (Manganese): 3.1 mg, E6 (Zinc): 31 mg - Technological additives: Pentasodium triphosphate: 1 g.
There are currently no questions for Royal Canin Feline Vet Care Nutrition Skin & Coat Formula Cat Food - be the first to ask one!